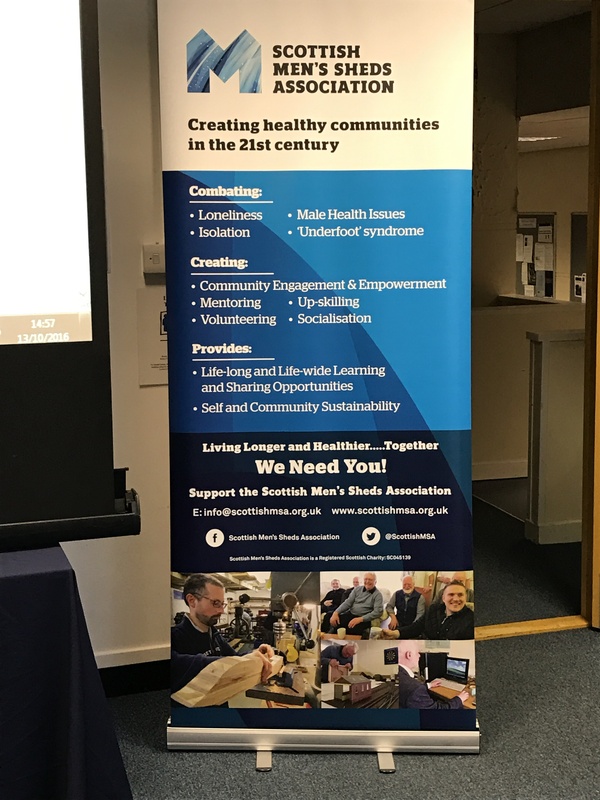 Last week I attended ‘Men’s Sheds: the movement in Scotland and the big picture internationally’, an event, organised by the Centre for Research & Development in Adult and Lifelong Learning (CR&DALL) at the University of Glasgow. Our blog on the Men’s Sheds movement was one of our most popular last year. The movement originated in Victoria, Australia in the 1990s, as a place for men to socialise and take part in practical activities. 23 years later, there are now close to 1,000 such spaces in Australia. Sheds have also proven popular in Ireland (350 Sheds and counting) and Scotland (at least 38 up and running, with 30 in the start-up phase). Research has indicated that loneliness and isolation are a particular issue for certain groups of men, which is reflected in higher suicide rates. Evaluations of Men’s Sheds have found participation to have a range of positive effects for these groups of men, predominantly in terms of their mental health and wellbeing. The importance of Sheds not being regulated by outside agencies, e.g. government – this was something that those involved in Sheds felt particularly strong about. As noted by Professor Mike Osborne, the Director of CR&DALL, at the start of the afternoon, the reduction in government support for adult education has created a need for people to organise themselves in order to access lifelong learning opportunities. Thus, those who attend Sheds feel strongly about preserving the independence of the space, as well as its democratic dynamic. How to ensure the sustainability of Sheds, and community projects in general – Willie described how the SMSA can support Sheds across Scotland by offering advice on applying for funding, how to keep things like rental costs low, and using mechanisms such as the Community Empowerment Bill and Community Asset Transfers to their advantage. Noting the difficulty that many community projects face in sustaining themselves long-term, Willie highlighted the Clydebank Independent Resource Centre (CIRC), which has been running for over 40 years, as a rare but good example of how sustainability can be achieved. The second speaker of the day was Professor Barry Golding from Federation University Australia. Barry is the most prolific researcher in the area of Men’s Sheds, and published The Men’s Shed Movement: The Company of Men last year. Barry described the origins of the movement in Australia, and suggested it took off due to its provision of the three key things that men need: somewhere to go, something to do, and someone to talk to. 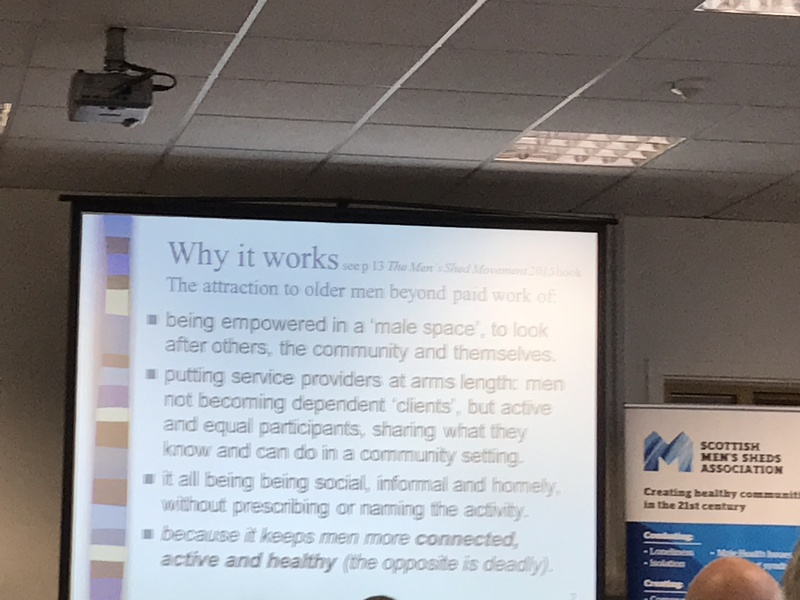 Barry also emphasised the importance of not formalising Men’s Sheds, and particularly not promoting the spaces as somewhere where men with health issues go (not a very attractive prospect to an outsider!) This point was also picked up by David Helmers, CEO of the Australian Men’s Shed’s Association. David described the experience of one Australian Shed who had a busload of patients arrive after being referred by health services. The point of the Shed is to create a third space for men (other than home or work) where they can relax and socialise with their peers. Any learning or health improvements that arise from this is coincidental and not forced. Barry and David were followed by John Evoy of the International Men’s Shed Organisation (IMSO). John focused on the experience of Sheds in Ireland, noting the impact of the recession as a particular reason why the movement has taken off in Ireland. 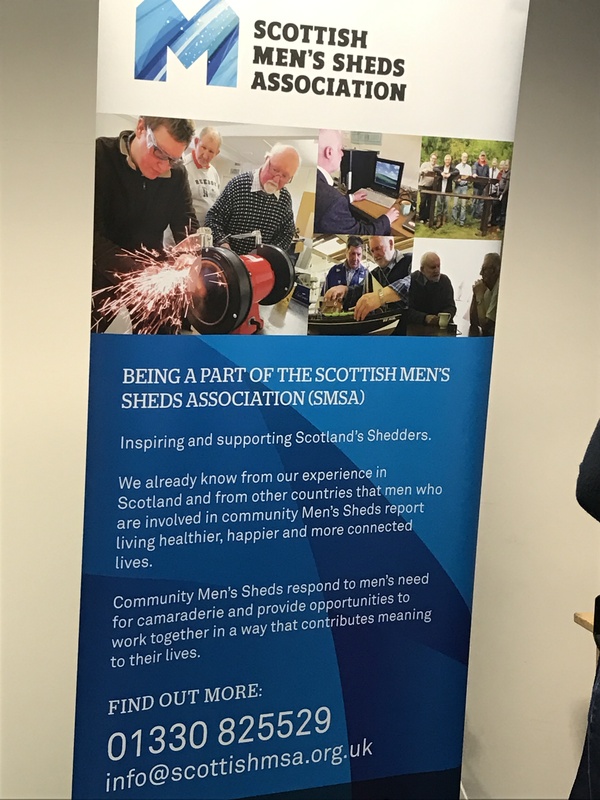 The IMSO’s aim is to support a million men through Sheds by 2022. To finish the afternoon, two panels comprising Shed members and researchers considered the questions of how to strengthen and sustain the Men’s Sheds movement, and how research might be beneficial to this. Shed members on the panel and in the audience suggested that changing the stereotype of Sheds as spaces for older men with health (particularly mental) issues is important. In fact, men of any age are welcome to attend their local Shed, and current members are particularly keen to encourage this in order to support the intergenerational transmission of practical skills that are otherwise at risk of being lost. In terms of available evidence, it was noted that research on Men’s Sheds is still scarce, and focused on the Australian experience. Catherine Lido, a lecturer in psychology in the university’s School of Education, discussed the pros and cons of carrying out a systematic evaluation of the movement in the UK. Again, the importance of the democratic nature of Sheds was raised – allowing outside agencies, particularly government, to come in and carry out research would involve the loss of some control. Any research conducted would have to be participatory, in order that Shed members did not feel like they were the subject of an ‘experiment’. Barry Golding highlighted, however, that there is currently almost no data on UK Sheds available; rectifying this could strengthen Sheds’ chances of being successful in applications for funding to support their running costs. If you enjoyed reading this, you may also be interested in our previous blog on ‘makerspaces‘, which have drawn comparisons with the Men’s Sheds movement. This entry was posted in Education and Skills, Health and social care, Regeneration and community development and tagged adult education, Australia, Barry Golding, community projects, CR&DALL, evaluation, evidence, grassroots action, Ireland, lifelong learning, loneliness, men, Men's Sheds, mental health, participatory research, practical skills, recession, research, Scotland, Scottish Men's Sheds Association. Bookmark the permalink.